The Big Wobble: Hamburg airport evacuated and 50 treated over an unknown substance believed to have been in the air conditioning system:Unknown substance was later found! Hamburg airport evacuated and 50 treated over an unknown substance believed to have been in the air conditioning system:Unknown substance was later found! Hamburg airport in Germany was briefly evacuated and at least 50 people were injured by an unknown substance believed to have been in the air conditioning system. 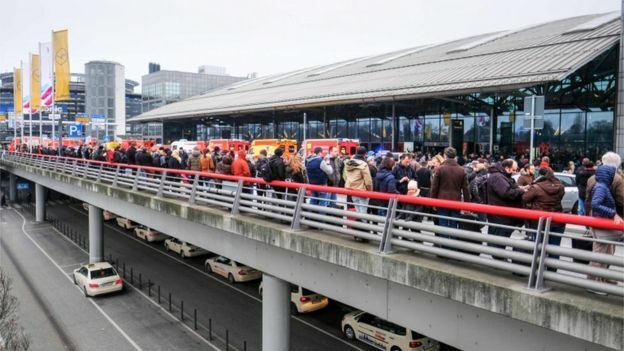 German firefighters on Sunday evacuated hundreds of passengers at Hamburg Airport after about 50 people were injured by an unknown hazardous material that likely spread through the airport's air conditioning system. All flights were halted for several hours due to the evacuation, but air traffic started running again around 2 p.m. (8 a.m. ET), airport spokeswoman Karen Stein said. More than 50 people - both passengers and staff - had complained about breathing problems, burning eyes and nausea. Firefighters were examining them to find out whether they had to be taken to the hospital, the German news agency dpa reported. Those who were evacuated from the airport but not injured had to wait outside the terminals in freezing temperatures. Firefighters designated special areas outside the airport building where physicians were examining those injured by the unknown substance. The cause for the incident was not known, Stein said, "but we're working closely together with the authorities to find out more." An unknown substance was later found in the security check area, Reuters quoted a police spokeswoman as saying.